Trojan's alternate Tri-Cabin features direct drive engines below the salon, and offers a twin 200 HP diesel option that gives spirited performance on minimum fuel. 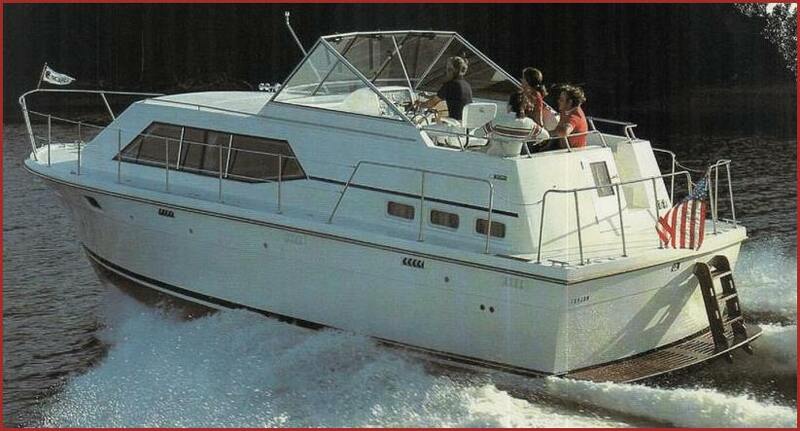 She also features the kind of privacy that has made both our Tri-Cabins famous. 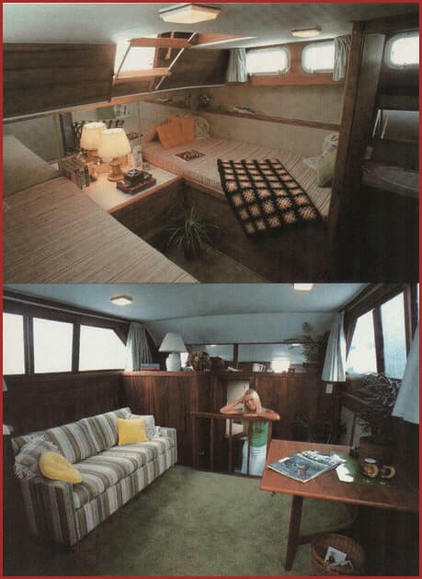 With three separate (not just separated) sleeping areas. An aft stateroom with a head that has a great stall shower. A forward stateroom with a handy athwartships staircase. And a salon roomy enough for a convertible sofa. The galley is a gourmet cook's delight, and features a big stand-up refrigerator, combination stove, and plenty of counter-top space. Like all Trojans, she's earned her performance stripes from the Great Lakes to the Gulf of Mexico. 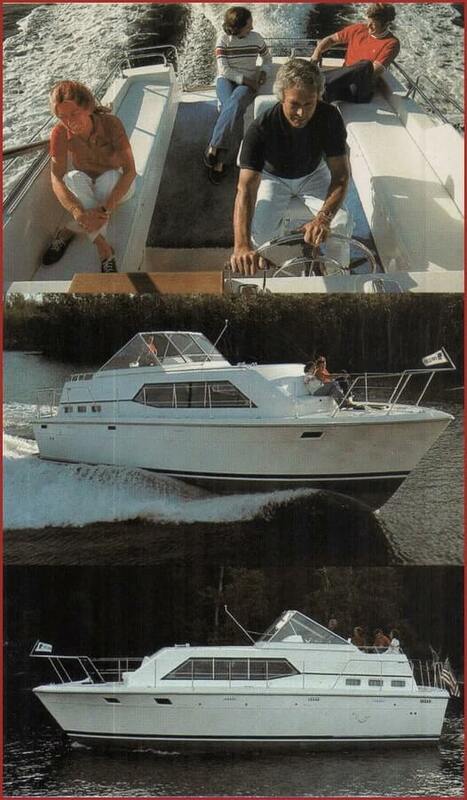 In addition to the equipment list at the back of this catalog, standard equipment includes: complete bridge level control station; sun-deck seating with cushions and storage under; stainless steel taffrail; flagstaff and socket; springline cleats; frosted Plexiglas hatch; safety glass windshield and cabin windows; screens; hydraulic steering; dockside wiring with 50' shore cable; Power Sentry System; trim tabs; hot water system; pressure water; full-width mirror in main salon; aft stateroom with twin beds, mirrors, hanging locker, vanity and access to aft deck forward stateroom with V-berths, full-length mirror, hanging locker, and drawers; complete galley with 10 cu. ft. upright refrigerator, 3-burner electric stove, oven, stainless steel sink, and storage lockers; two complete lavatories with Monomatic II toilets, stainless steel basins, exhaust fans, vanities and mirrors; stall shower aft.